A look at albums we have written about in 2013 – here’s Tommie Potts and the 2013 RTÉ release ‘Traditional Fiddle Music from Dublin‘ taken from Irish Music Magazine. 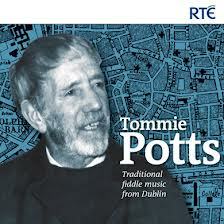 There’s an abundance of archival listening pleasure in RTE’s compilation of recordings from the inspirational fiddle playing of Dublin’s own Tommie Potts. Anyone who has an interest in traditional music will have heard or been influenced by his style and vision and there are 47 tracks of raw instrumental in this CD that show why. Some refer to Tommie as a legend in the tradition and with others it was his progressive outlook to music by which he was revered. Tommie himself in his album notes on his recording, The Liffey Banks, noted that, whilst he agreed with the basic structure of the music he knew it was much more than just a technical process: “As I progressed in making sound on the fiddle, I found I was stirred with thought and feeling. But shouldn’t good music affect in this way?” he writes and this emotive aspect is inherent in tracks such as An Chúilfhionn and The Blackbird. The ability to own a tune and mark it with a signature is instinctively apparent in the reel, The Morning Dew where the style and creativity of the bow movement produces individuality in interpretation of the melody and this style is a trademark as the album takes the listener through a wealth of exciting audio. As well as his inimitable tunes there are also highlights of recorded vocal that provide an insight into the man and his passion for the music. Mícheál Ó Súilleabháin in the sleeve notes describes Tommie’s music as “emerging out of its own past as an inspired voice for a future generation” and, well Mícheál, I couldn’t have put it better myself. A definite must for a musical archive.